On the first day of its spring General Conference on Saturday, March 31, 2018, the LDS Church will announce how many convert baptisms took place in 2017 as well as how many missionaries are currently on the field. The past two years have seen a huge decrease in missionary participation and conversions to the church. 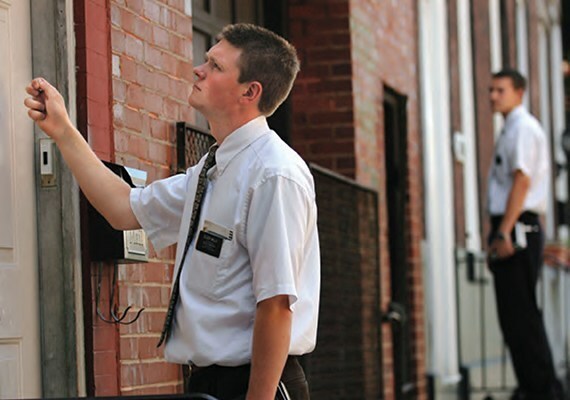 From 2014 to 2016, the number of Mormon missionaries on the field went down 20%. This makes sense when it is understood that there was a huge increase of missionaries from 2013-2014 after a church policy was enacted in 2012, allowing young men to enter the field at 18 years of age (rather than 19) while females were permitted to serve at the age of 19 instead of 20 ½. The number of applications skyrocketed immediately after that announcement. In 2012, there were 59,000 missionaries serving the church, but that number skyrocketed to 83,000 in 2013, which is up almost a third! The following year the number hit an all-time high, 85,000. These two years of higher numbers were the result of double-dipping since both 18- and 19-year-old men were entering the force along with 19- and 20-year-old women. In March 2015, Apostle Jeffrey R. Holland—apparently full of enthusiasm in an interview with conservative radio show host Hugh Hewitt—said the number in January 2015 was holding steady at 85,000 and boldly predicted that “probably within four years (2019), the base-line number for the missionary force will be something around 100,000″ (Salt Lake Tribune, March 4, 2015). However, the braggadocio of the General Authority was short lived. The next year, the church announced that the number of missionaries in 2015 went down 13% to 74,000, decreasing another 5% in 2016 with 71,000 missionaries serving the church. Meanwhile, the number of LDS converts also took a sharp dive. In 2012, there were 272,000 converts, but it went up in 2014 by close to 10% to 297,000 new believers, thanks in great part to the most missionaries ever sent out by the church. However, in 2015 the conversion number went down to 257,000 and even declined further in 2016 to 240,000, seemingly a direct result to having some 15,000 fewer missionaries in the field. Stated another way, if we were to assume that the missionaries were responsible for all the conversions–and obviously, they are not–there were 4.6 average converts per missionary in the field in 2012. From 2013 through 2016, however, this number plummeted by a 25%. In a March 9, 2018 article published in the Salt Lake Tribune, religion writer Peggy Fletcher Stack talked about how missionaries are allowed to use technology to share their faith. In 2014, most missionaries entering the field were required to purchase iPad Minis for $400 each that could be used on their missions. Smart phones were later given a green light in some missions, and in late 2017, missionaries in 162 (out of 422 missions) were allowed to use the devices, double from the 87 missions that had previously incorporated this technology. Thus, in 2012, 13% of the missionaries were female (7,670), increasing to 30% of the force in 2016 (20,400). This means that the male representation in the Mormon missionary force decreased by about 8% from 2012 to 2016. The LDS Church seemed to have everything going for it in 2012. There was The Book of Mormon Broadway play that generated plenty of free publicity. The “I am a Mormon” campaign was in full swing. Campaigning for the highest office in America was a faithful Latter-day Saint. With so much positive taking place, the media called this year “the Mormon Moment.” And, as Thomas S. Monson announced that year, more missionaries would be able to enter the field through the lowering of the age of entrance. Could this be the beginning of greater numbers down the road? Type “Mormon missionary” into a Google search engine and the first site that comes up is “Meeting with Mormon Missionaries” on Mormon.org. Source A visitor to the site will get a pop-up ad at the bottom right hand side of the screen offering a “FREE Book of Mormon,” with another box offering a place to chat or call in with “any questions you may have.” This technology is meant to help the missionaries better maximize their resources and allow them to spend more time with potential converts who may be more attentive to the Mormon message. No longer will the majority of a missionary’s time have to be spent “cold-calling” in unfriendly neighborhoods while getting chased by unfriendly dogs and angry residents. Yet, despite these advances in technology, the church numbers continue to shrink. Why? Perhaps it was the technology itself that has forced the church to come out with the head-scratching Gospel Topics essays produced from 2013-2015. While some leaders must have thought these pieces would serve as damage control and any ill effects dissipating over time, many continue to leave the church as a reaction to this information admitted to by the church, including (among other things) that Joseph Smith married 30-40 women as well as how he peered at a seer stone in a top hat to translate the every-holy Book of Mormon. Although the essays are not easy to find on the church’s website, they do remain on lds.org and, for now at least, are there for anyone to examine. The answers offered by the church scholars have been less-than-persuasive to many who learned facts about their church’s history that they would have only imagined were invented by those in opposition to the church. Unlike two or three decades ago, the technology of the Internet has been detrimental to the church. Before 1995, someone who wanted to research Mormonism and its beliefs would have had to visit a local library. Today, the information about the church is available in the privacy of one’s home where nobody else has to know. Thus, the church was able to grow by 330,000 converts in 1990; however, despite double the membership a quarter century later, the annual convert rate has declined by about 30%. Imagine if the church had been able to continue its torrid pace as typified in the 1990s! Pollster Rodney Stark, a Mormon, had even made what looks now like an outlandish prediction when he said the projections at the time would mean there would be 267 million Mormons by 2080. In recent years it takes 4-5 years just to grow by one million members. LDS Church leaders seem desperate to retain its membership while somehow being relevant in a post-modern world. People are fleeing out the back door of LDS chapels while new converts are harder to come by, despite the number of additional missionaries in the field. Although he is supposed to be a “prophet, seer, and revelator,” Holland’s prediction that the church would have 100,000 missionaries was way off the mark. There were more LDS missionaries in 2014 than in any time in history, yet just two years later (2016) there was a 20% decline. Meanwhile, there are fewer male missionaries—these supposedly have the authoritative priesthood—who are willing to spend two years of their lives on the field. It’s the females (those with no priesthood authority) who are propping up the numbers. With all of this considered, the future growth of Mormonism’s missionaries and, as a result, converts seems to have stagnated with no apparent chance of recuperating. Unless, of course, the prophet decides to try another temporary course correction and ask 17-year-old members to skip their senior year of high school so they can enter the missionary field early. This seems highly unlikely.